In December, the Yangshan Deepwater Port in Shanghai will start operating 7 new berths with depths of 15m, boosting Shanghai’s annual handling capacity up to 40 mln TEU and thus confirming its status of the world’s busiest container port, writes South China Morning Post. 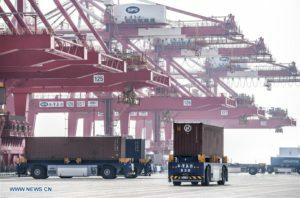 According to a press officer of Shanghai International Port Group, Yangshan port’s owner and operator, Phase 4 terminal will be launched on December 10. The USD 1.95 bln project will expand the Yangshan port’s capacity by 11%, up to 6.3 mln TEU per year. Yangshan’s construction began in 2002 in Hangzhou Bay, south of Shanghai, on the reclaimed land plot around the islands of Greater and Lesser Yangshan, with the idea of allowing Shanghai to grow despite the shallow waters near the shore. Three years later, in December 2005, the port was officially opened for operations with 2.2 mln TEU annual capacity. The new deepwater port is connected to Shanghai’s Pudong New Area by the 32.5 km Donghai Bridge, the world’s longest sea bridge, and forms part of the Port of Shanghai. Servicing the trade emanating from the Yangtze River delta around Shanghai, the port of Yangshan is part of the free-trade zone that Shanghai began developing in 2013 in order to facilitate the trade. Besides, customs authorities in Shanghai have streamlined the process of customs clearance to just two hours from one day. By 2010, Shanghai had surpassed Singapore as the world’s busiest container port by volume. Last year, Shanghai handled 37.1 mln TEU, an increase of 1.6% as compared to 2015, retaining its crown among global container ports for the seventh consecutive year. With the opening of Phase 4, Yangshan will be China’s biggest automated container port. As many as 130 automated guided vehicles (AGVs) will be deployed at the port, the largest number installed in any container terminals worldwide. Earlier, we wrote about another Chinese project of a fully automated container terminal – Qingdao New Qianwan Container Terminal (QQCTN), that was officially put into operation in May 2017. The terminal is equipped with 7 STS cranes operated by remote control, 38 automated stacking cranes (ASCs) and 38 AGVs and has a designed capacity of 5.2 mln TEU.